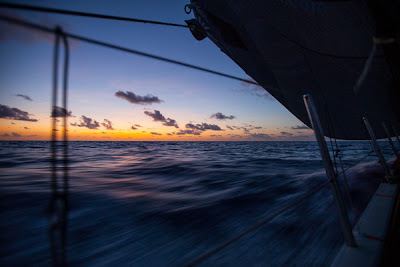 Our time along Brazilian shores has not been brief – it’s an enormous coastline – and we continue to have chance encounters with other maritime vessels of all shapes and sizes. Oil rigs, oil ships, oil rig supply ships, oil ship supply ships, container ships, large fishing boats, small fishing boats, and boats that we know nothing of. Early yesterday evening our course took us directly across the transom of a tiny wooden fishing boat, anchored no less than 50 miles from shore, and as we went by waving hello to four surprised locals at 18 knots, it’s impossible not to wonder if our new spectators have any comprehension of what they’ve witnessed. They have likely never laid eyes on a boat like ours, and likely never will again. 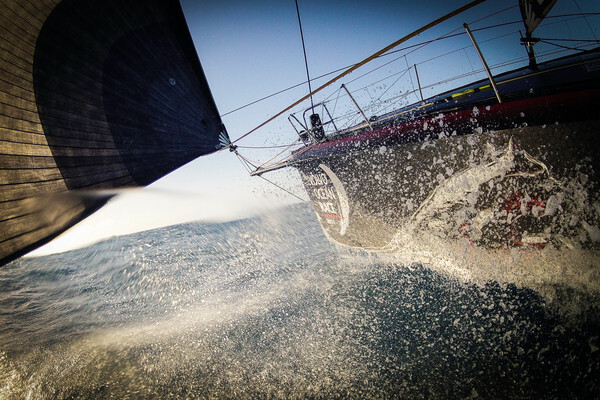 A giant black jumping cat emblazoned on a tentacle-covered sailboat, a fast sailboat, faster than many powerboats. It must be bizarre but exhilarating, if only for a brief moment before we’re gone again, like a mysterious UFO just passing through. 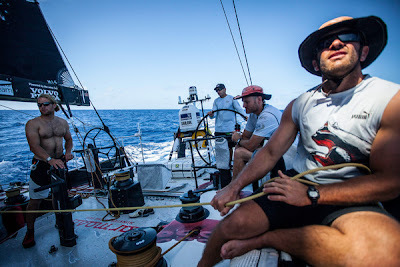 Looking back on the six prior legs of this race, I wonder if the countless mariners we randomly intersect, lives we intermittently traverse in the middle of the worlds ocean: what did they do when they returned to land? 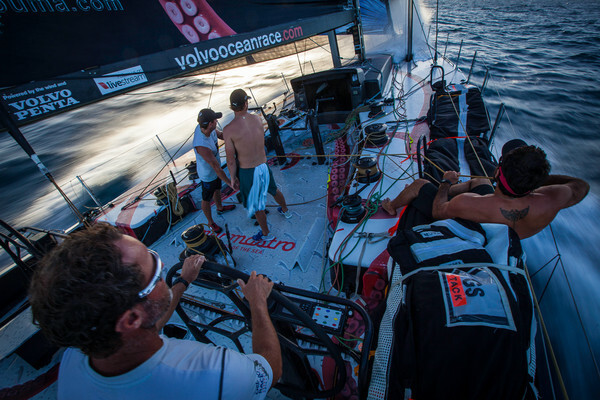 Are they new PUMA Ocean Racing Facebook fans? Are they reading this update, avid followers of our plight like the sailors of the ZIM MONACO? Did they Instagram a photo of us from their fancy smart phone? Or not. Are we just an intense flash of a story on an otherwise typical workday for some seafarer that knows nothing of Volvo cars, PUMA clothing, carbon fiber, or the World Wide Web? There was the ship of long liners off Sri Lanka, forcing us into a hard preventative bear away and a close race mark like rounding (I don’t know what was more impressive, the stench from their hold or Tony’s reaction on the helm). There were the countless unlit dinghies in the Malacca Straits, clueless as to the danger a night in our path could present. There was the teeming port of Singapore; an evening spent dodging and weaving through hundreds (maybe thousands) of anchored 300-meter ships. There were the fishing boats off Japan and the fishing boats off the Solomons. There was the fleet of halogen-lit squidders near Chile and then the busy trans-South Atlantic shipping lanes, the very one that brought us to our ZIM MONACO friends and eventual Tristan salvation. As we sail north through the Caribbean and finally arrive to very modern civilization in Florida, it’s hard not feeling a tinge of admiration for the simpler sailors we meet out here. Our brief exposure to their world on the sea is as much a surprise to us as we must be to them. But I still wonder…do they have any idea what they’ve seen?? And where are they now…what have they done with their cell phone photos or word-of-mouth tall tales? Just how far in the world has the story of our Mar Mostro reached?